Most of us have taken trips: trips with our friends, trips with our families, trips with our children. If we haven't taken the trip, we've talked about the trip - let's go to Vegas for your 40th, let's meet the Sullivans in Colorado to go skiing, let's get all the cousins together and rent a beach house next year. More likely than not, we've put off a vacation. We wait until we have more money in the bank, until we finished that big project at work, until the kids are older/out of diapers/in school, until I'm done nursing and pumping. We wait and wait and wait -- and then we don't take that trip. Right before I got married, I pushed my husband to take a trip to Ireland with our families. His family was going to be there celebrating an uncle's milestone birthday and my extended family was also planning a big trip for an aunt's milestone birthday. It was the trip of a lifetime, in my eyes. A few days with his side, a few days with my side, and a couple of stolen day trips in the middle for just us. It was a dream trip. 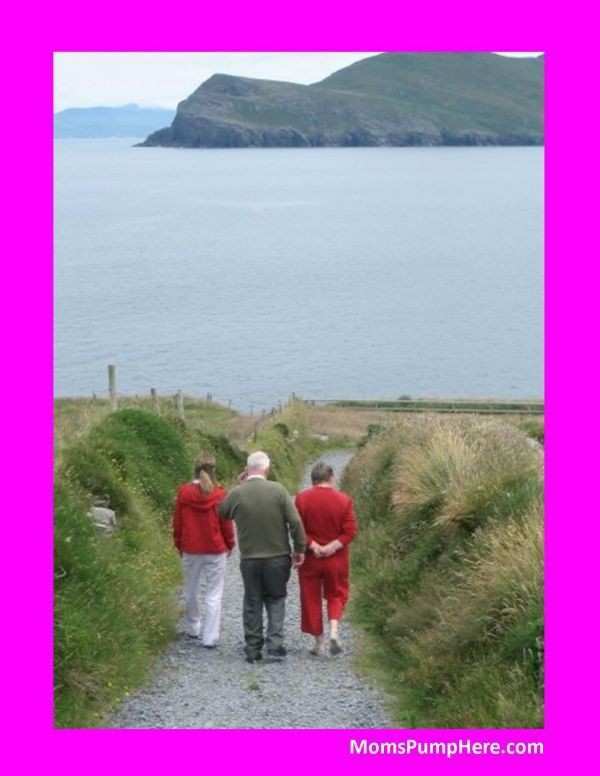 The picture attached shows me walking down an Irish path with my mom's cousins, Joe and Kay. Joe was the lighthouse keeper on the island where my family lives and his wife Kay bakes the scones which are sold in the village's cafe (that is managed by their son and daughter-in-law). Another cousin runs the pub, another runs the life boats, and still another manages the bed and breakfast we were staying in. This picture reminds me why we took the trip - we were putting time with family before everything else. My friend Paul and his wife are taking a trip to the tropics next month, and we asked how he feels about traveling with a young child (our children are both 5) for such a long fllight (yet another reason we talk ourselves out of taking a trip). Paul's reply made several of us stop and listen: "I don't worry about that stuff anymore. Take the trip. Time spent with your families is a gift you give to each other. If you're always waiting for a better time, it's not going to come...by the time you're ready to go on the trip, your children will not want to hang out with mom and dad...Take the trip." Paul values time spent with his family over everything else and I appreciated being reminded of how important that is. Your children today will not care how much money you have in the bank, how long the travel was to get there, or what work plans were put off so you could take the trip. They will know you put time with them before everything else - and that is what makes the trips worth taking.